Determines the in-place density of soils. ASTM D1556, AASHTO T191, 6.5" (165mm) dia. bottom cone. Determines the in-place density of soils. ASTM D1556, AASHTO T191, 4.5" (114mm) dia. bottom cone. 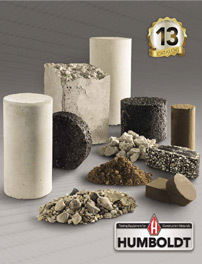 Use for gravel and coarse soils, complies with C.O.E. Density Sand for Sand Cone Test, 50lb.